Much of south-central Europe is dominated by a strenghtening upper ridge while deep trough is placed across E Europe and W Russia. 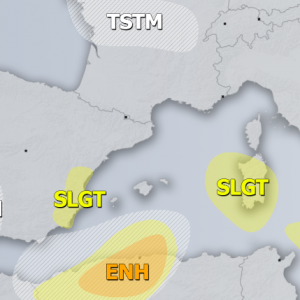 A short-wave trough / upper low enters Iberian peninsula from the west and active severe weather is expected. A small wave crosses S UK and Benelux in the afternoon and evening hours. 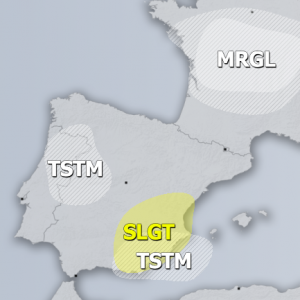 MDT/ENH/SLGT risks have been issued for east-central Spain with threat for severe damaging winds, large to very large hail, torrential / excessive rainfall with flash floods and tornadoes. It appears likely that an outbreak of severe storms could verify, as a rather deep upper low entering Spain from the west, rounded by a very strong jet stream (60-70kt at 500mbar). Ample shear overlaps with moderate to strong instability (1000-1500 J/kg of MLCAPE) across the warm sector ahead of the slowly eastwards moving cold front. Boundary layer moisture will undergo a significant recovery due to E-SE low-level winds advecting warm and humid airmass from the western Mediterranean. Storms are expected to form by midday as a strong ascent within the left-exit jet region overspreads the risk areas. Given the good overlap of strong shear and instability, this environment should promote initiation of scaterred severe storms, including intense supercells with large hail, severe damaging winds and torrential / excessive rainfall due to slow moving storms. Low-level E-SE inflow layer winds should enhance tornado threat with the more discrete and stronger cells. Storms should merge into large cluster or two (MCS) towards the evening hours and continue into the night with mainly severe damaging winds and torrential rainfall /flash floods threat. ENH/SLGT risks have been issued for SE UK, Benelux into W Germany with threat for isolated large hail, severe winds and torrential rainfall. Models are again overdoing near-surface dewpoints but strong insolation should still easily result in strong instability in the afternoon, MLCAPE likely in excess of 2000 J/kg. Placed under moderate shear, favorable conditions are in place for organized storms, including supercells. Strong cap should limit storm initiation until quite late in the afternoon but once the forcing increases and capping weakens, at least some isolated storms can be expected across S-SE England as well as far NE France into Belgium and S Netherlands. Main threats will be large hail and severe winds. Some clustering can be expected towards the evening when storms continue into W Germany. A SLGT risk has been issued for E Hungary, Romania, Moldova and NW Black sea with threat for severe winds, torrential rainfall and large hail. As a short-wave trough enters the risk area from the WNW, storms should initiate and fuel with moderate instability and shear. Locally 1000-1500 J/kg of MLCAPE should be enough for large hail events. It’s likely that a larger cluster will form before the evening and move across E-CNTRL Romania into NW Black sea in the evening hours. 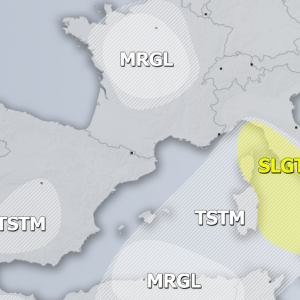 SLGT risks have been issued for S and NE Turkey into Georgia with threat for isolated severe storms, capable of producing large hail, severe winds and torrential rainfall. Diurnal driven storms will form in moderately sheared and unstable airmass by early afternoon and should diminish in the evening hours when instability vanishes.